Young children are spending the Easter holidays in Sats revision classes at hundreds of primary schools, a union has said. Former Manchester United defender Gary Neville launched a scathing attack on the club following Saturday’s heavy 4-0 defeat at Everton. The United Nations secretary general says he is “outraged by the terrorist attacks” in Sri Lanka. 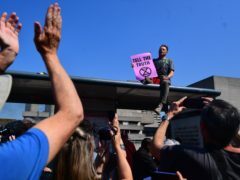 The Extinction Rebellion movement is here to stay, will not go away, and is set to keep growing, wildlife television presenter Chris Packham has said. Celtic’s title celebrations have been delayed after they were held to a goalless draw by Hibernian at Easter Road. Neil Lennon told his Celtic players that they are not yet on holiday after drawing a blank in the 0-0 draw against Hibernian at Easter Road. At least five Britons are among more than 200 people killed in a series of bombings which ripped through churches and luxury hotels in Sri Lanka. Wales, Scotland and Northern Ireland have each enjoyed their warmest Easter Sunday on record, the Met Office said. The killers of murdered journalist Lyra McKee have been urged to disband. Manchester United’s season took a drastic turn for the worse as they crashed to a humiliating 4-0 defeat at Everton in the Premier League.